I'm finally caught up on my blogs. I'm even including pictures taken today. Whoopee! After Chisolm we headed north towards International Falls. There was an Elks Lodge which was listed as having RV parking. Well....... maybe before. There was the parking lot, and there were the hookups, but now the parking lot belongs to a restaurant and they don't allow RV parking, only restaurant parking. Several years ago the lot belonged to the city and the Elks used the lot, even installing electric for those traveling RVers who occasionally stopped by. But then the lot was sold, a new restaurant built, and now, no RV parking. We did find a vacant lot nearby and talked to the owner who would have let us stay there since we were Elks, but it was noisy and we decided instead to splurge and go somewhere with hookups for a change. It was recommended to try Arnolds RV Park, a small (about 12 sites), quiet, shady park with elec. We stayed there our week in International Falls. Yes, a week. Originally we were only going to stay a few days, long enough to see Voyageurs National Park, and then move on, but thank goodness our plans are made in "jello". Voyageurs National Park is only accessible by boat. Although we planned on kayaking to the park, which is a series of small and large islands, the park service had several boat trips which you could take. We wanted to go on several of these boat trips, but couldn't get reservations until the weekend. And in the meantime, there was an International Bass Tournament going on in town with lots of festivities and CMA (Christian Motocyclists Association) was having a 'no boundaries' rally too. So we extended our stay, booked the tour boats and enjoyed the festivities around town. We are leaving in the morning to head to Lake of the Woods, but while here we did kayak to Kabetogoma Peninsula from the Rainey Lake Visitor Center (also the Voyageurs National Park Visitor Center). Our boat trip to Kettle Falls got cancelled due to wind, but we did take the Grand Tour today which included Little America Island, site of the gold fever which swept this area in the early 1900s. BTW, do you know what International Falls is known for? It's claim to fame is "Icebox of the Nation". They grow them walleye big up here don't you think? They also claim Smokey the Bear originated here. I have heard New Mexico also claims this, so who really knows, but here he is in the park named for him. This is also the park which hosted the bass tournament and rally. They said there was to be a boat parade. I couldn't figure out where since there is no waterfront area in International Falls. Here is their version of a boat parade. This is the way to ice fish. Drive this baby out on the ice, set it up and open up the well, get the auger out and drill out your hole. Then start fishing. These ice fisherman have it so easy. But my all time favorite site here was in the small town of Ranier, 2 miles east of International Falls. Look closely at the sign. How would you like to hire this guide who advertises to be a "fairly reliable guide service"? So much for a warm fuzzy feeling! We rode our bikes out to Ranier. From the campground we had traveled about 4 miles. But it wasn't quite lunch time yet and we had planned to bike out, have lunch and bike back. So we decided to continue the bike trip on out to Island View Lodge, which we thought was only about 6 more miles down the road. We also thought there were no hills. Well we were wrong on both. Just before getting to the lodge there was 1/2 mile of steep hills and by the time we arrived we had traveled 14 miles. We stayed for lunch, then returned. It was a tiring trip since we fought a stiff headwind both ways, but by the time we arrived back at the campground we had biked 28 miles. Looking out on the park. On our boat trip today we went out several miles to a small island where this now defunct fishing camp existed. In its heyday, it was the site for a commercial fishing venture. What you are looking at now is the ice house, where they cut and stored several tons of ice during the winter to keep the fish cold in the summer. Yes, they actually cut enough ice to last all summer. Another stop was Little America Island. This is what is left of a 210 foot shaft on one of the 17+ mines on the island, which couldn't have been more than 1/2 mile square (or round rather). We also saw wildlife, several eagles and their chicks, an eagles nest, a deer with a huge rack, cormorants and loons. Here is a mother and chick. Leaving Two Harbors, my friend, Max, and I headed north towards Virginia, Chisolm and Hibbing or otherwise known as "The Iron Range", while the rest of group headed towards Cass Lake. The Iron Range was named such because most of the Iron Ore mined in the U.S. comes from this area. It houses the largest open pit mine in the world, the Hull Rust Mine. Also known as 'the grand canyon of the north', it is 3 miles long and 1 mile wide, but only 600 feet deep. We were somewhat disappointed. Looking at it was just like looking at any other open pit mine. I'm not sure what we were expecting, but we didn't get it. But, some of the equipment was enormous as you will see in the picture. What was interesting, the Hull-Rust mine is still operating. Many of the other mines we viewed in the area have long been inactive. Our first stop was Virginia, MN. We stayed in the Elks parking lot. The day we arrived there was a classic car show going on in downtown Virginia, just a few blocks from where we were staying. We walked downtown and viewed the cars. Later we took a drive over to Gilbert and Eveleth, all within 5 miles. All these towns were founded around the mining community which is still the leading employer of the area. Moving on the next day, we stopped at Mountain Iron, but found everything was closed. If we had only known, they had a parade and festival the day before. There was even a street dance and we missed it. One thing I wanted to look for in this town was a different kayak. There was advertised an outfitter who had used kayaks for sale. But they too were closed and from what I could see, they didn't have much anyway. So on down the road to Chisolm we went. It was only 15 miles or so to Chisolm so we still had plenty of time to look around once we arrived. We were told we could park in the visitor parking for where the "Iron Man" statue was located. Indeed, when we arrived there was a sign allowing 24 hour parking. Most of our transportation in Chisolm was by bike. One of the places we biked was the Mesabi Trail, a fairly new rail to trail. Although someday it will be over 100 miles, it is only completed in places now. Luckily it was completed between Chisolm and Hibbing. It was a 22 mile ride round trip. That was the longest bike ride ever for me. But in Hibbing is where the Hull Rust Mine was located. Also in Hibbing was the Greyhound Busline Museum. If you are ever in the area, do go to the museum. Did you know this nation wide busline was started to provide transportation to the mine workers? In the early 1900s several miners realized the need for the miners to get out to the mine. Very few people could afford cars and the mine was too far to walk. Also they provided transportation between several of the local towns in the area. From this and many mergers and new owners and partners, eventually came Greyhound. But it all started in Hibbing, MN. These tires cost upwards of $20K each and have to be replaced often because the iron ore can still puncture these huge things. What a hunk of machinery. Here I am under one of the Mesabi Trailhead signs right outside of the Greyhound Busline Museum. Back in Chisolm, we rode downtown and found this on the side of one of the older buildings. Do you remember Doc Graham? Now I have to go back and watch the movie again just to see if I recognize anything from the town in the movie. There was also a Mining Museum in Chisolm on the grounds of a park complex, but it was Sunday and closed. The entire complex was built back in the depression by the CCC and had some beautiful buildings built in the style of a castle, with large walls all around. We also found there was a free dump site there for all you travelers. While in Two Harbors we stayed at the Moose Lodge, all 18 RVs. We went to Duluth, took a day trip up the North Shore to visit Gooseberry Falls and Split Rock Lighthouse, took in the local sights, and rode our bikes for pie. We were told we just had to go and eat at Betty's Pies. So most of us got on our bikes and rode the 3 1/2 miles to the restaurant. Many of us also had their specialty of broasted chicken before having our pies. I believe we all agreed, the pie was great. Several returned a few days later and had pie again. In town there was the 3M museum. Yes, that is the big 3m corporation. It started in 1905 in Two Harbors. The company went 11 years before showing a profit, but it knew it had a good idea and look where the company is today. And its first product and still one of its best sellers? Their sandpaper. Also in town was the lighthouse which we toured; a tug boat built in the late 1800s and was still operating until 1971; the ore docks, which we got to see an ore ship being loaded the day we arrived; and the old train depot and museum. Side by side they had an old steam ore train engine, one of the last of the largest ever built, and next to it was a newer diesel engine. Both had been owned, just like the tugboat, by the ore companies to move the ore down to Lake Superior for shipping. I bet no one knew I had a restaurant in Two Harbors, did you? We ate breakfast there and it was pretty good. Gooseberry Falls and Split Rock State Park and Lighthouse were both on our day trip north of Two Harbors. We did some hiking at both places as well as climb the lighthouse. This lighthouse was not as important as the fog horn. If the ships could hear the fog horn, then they were too close. The fog horn could be heard 7-10 miles out. We came back the next day and hiked up Split Rock River to Split Rock. Yes, there was a reason it was named split rock. It was a fun hike, 6 miles along the river. We took way more time than usual because we foraged the thimbleberry and raspberry bushes along the way. The Lift Bridge in Duluth. It is in the down position for auto traffic. Here is the lift bridge in the up position for an ore freighter to pass under. It is said the cables which lift this bridge are so balanced, it could be done by hand. A viking ship in Leif Erikson Park in Duluth. Yes, again, there is a story here. We had heard we should go see the viking ship at the park, but when we arrived it was all covered up. A sign said they were taking donations so the ship could be restored and displayed. I think they would get more donations if we could see it first. Also, while in Duluth, we visited one of the first breweries in MN, Fitgers. It was a brewery from the mid 1800s until the 1980s (exact dates are not my thing). It is now being restored as a hotel and mall, but since it is on the National Historical Registry, it cannot be changed. They also have a new brew pub which we had to try. We also drove the skyline drive, which runs along a ridge overlooking the city and the harbor. And I have now been in WI. Across the bridge from Duluth is its sister city of Superior, where we went shopping at the Walmart. And since it was my birthday while we were at this stop, we returned to Duluth for my birthday dinner at Outback Steakhouse. Although we did lots of things, I only got pictures of a few. Again, at Ely, we had trouble finding parking for 20+ RVs, so the Chamber of Commerce worked to help us find parking. The town eventually came up with their old maintenance site for parking. We were within walking distance of town, hiking trails and the lake. While in town we attended "Tuesday nite live". A live band playing in front of the coffee shop. The street is closed down and the towns people bring their lawn chairs to sit and listen. There was also the farmers market, Dorothy Moulter-The root beer lady museum, the Wolf Interpretive Center and 2 kayak trips. One kayak trip was in the "boundary waters". These are the thousands of little lakes and islands which separate Canada from the U.S. Most of this area is only accessible via boats and hiking. Our other kayak trip was to a local lake where we paddled upstream through a small river into another lake. The area was beautiful, but we did not see any wild moose, bear or wolves. Here are a few pictures of other things I did. This old building was built around 1900. It was originally a hospital, but was sold and turned into apartments by the 1920s. It has been apartments until recently. Now the sign says it will become condominiums. I just thought it was a neat looking building. We visited Bear Discovery Center. This is not a zoo, just like the Wolf Interpretive Center is not a zoo. Both places only have a few acres and only a few animals. They study the animals and their habits. But these animals are handled from a young age by the staff and are used to them. But they are also not pets and I could not go out there without being in danger. Both places were very informative and I'm no longer quite as fearful of meeting a bear in the wild as I have been in the past. But this is still the only kind of bear I want to get near. On our kayak trip to the boundary waters we found these pictographs which were supposed to have been etched several hundred years ago by the native americans in the area. We all thought the moose looked way too much like it was stenciled. This was the day we had to portage (a fancy word for carry) our kayaks for 1/4 mile over rocky, uneven terrain, just to get to the water. Back in the late 1700s and early 1800s, when the Voyageurs brought trade goods and bought furs to take back to the east coast, they had to portage 36 ft canoes with thousands of pounds of furs or trade goods, sometimes 3 miles or more. Even though there were 16 men to a canoe, each man still had to carry at least one 90 pound bale as well as help carry the canoe. At the Dorothy Moulter museum, we learned about a woman who lived almost her entire life out on an island in the boundary waters. Even at age 60, she was still living with no electricity, no plumbing and having to bring everything she needed to live from Ely, which was miles and miles away. She had 5 portages, one which was over 1 mile, then 20+ miles of canoeing to get to town. And in the winter she was out there alone in weather which could be 50 degrees below zero. But she choose to stay out there until her death in 1986 at the age of 80. She was called the "root beer lady", since she provided homemade root beer to canoeists and fisherman who passed by her island. I guess Minnesotans have a different definition of a town than I do. This sign was on a small county highway, with not a building in site. Where was this town of Silver Creek? I know it's a little behind, but here is where I returned to the U.S., through Grand Portage, MN. 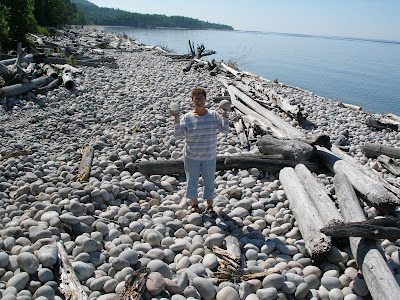 We continued on to Grand Marais, MN, where we stayed for about 5 days. During our time there the town was celebrating the "Fisherman's Festival". The fort at Grand Portage. The week after we were there they were having a "Rendezvous" and "Pow Wow". They were expecting hundreds of participants to be camped all over this fort. On a day trip down the Gunflint Trail we stopped for a hike. During the Fisherman's Festival there were lots of activities. She is an 8-time world champion log roller. This area was first settled by lumberjacks and they are quite proud of their heritage. Here we are waiting for the parade to start. Yes, this is a snowmobile acting like a jet-ski. This is quite popular around here. Everyone tries to see how long they can ride the water before they go down. The town even had fireworks for the festival. There were lots of other activities, but I can't begin to put up pictures of them all. Needless to say, there was roasted corn, fish burgers, dinner out at the Angry Trout, a BBQ on the beach, and the kayakers even got to be in the water parade. We had 14 of us out paddling. Because of the festival there were no campgrounds which could hold all 22 RVs, so the town allowed our club to park in their parking lot for the week. Even though the town didn't charge us, we all pitched in and gave a donation to a local organization. On our way to Ely, right outside of town was Cascade River. We stopped and hiked to the top. I believe this is one of the prettiest cascading river (hence it's name I'm sure) and falls I have seen yet. Our next stop was Thunder Bay, Ontario. We were parked at the Moose Lodge in town. For the first time in weeks we were close to a Walmart and and mall. Many of us took advantage of this and did our shopping to stock up on a few things. But there were many sights to see here as well. This area was famous for its fur trading back in the 1800s and Ft. Williams is the place to go see what it was like. They have interpretive tours daily, but the day after we arrived in Thunder Bay, they were having a reenactment. So of course, we were there. Here I was actually churning real cream. We watched a reenactment of the French and Americans, against the British and Canadians. Here they were getting the women and children out of the area. Actually, Ft. Williams was not a military fort, but a fur trading fort. Every year there was the large rendevous, where all the fur traders and representatives from Northwest Trading company gathered. It was a time where hundreds, maybe thousands gathered for business and well as recreation and social enjoyment. So the reenactment was not something which happened at Ft. Williams, but instead, was a reenactment, showing how the 2 sides fought and how there military strategies differed. The British soldiers are whisking away the locals. Kekebaca Falls was another place we visited. One place we were told we just had to go was Mt. McKay, a scenic overlook. It did give a nice view over the city and Lake Superior, but probably the best sight was being able to see the sleeping giant. If you look close, the mountains form the shape of a giant, laying down sleeping. The head is to the left and his arms are folded on this chest, with his legs outstretched to the right. Well, thats what they say anyway. They actually have made a state park at the location of the sleeping giant and people go there to hike and picnic. On the way to Marathon, we passed through White River, Ontario, the birthplace of Winnie-the Pooh. The town has erected a statue honoring Winnie. Winnie was based on an actual black bear, purchased by a military man. It became the mascot for his unit, but when he went into battle, he left the bear at the London Zoo for keeping. This is where the author of Winnie-the Pooh, took his young son, Chris, and first saw Winnie. Winnie was named for the home town of his owner, Winnepeg, Canada. A.L. Milne, author, was intrigued with the bear and eventually wrote his stories, basing them on the bear and his young son. At Marathon they have many items listed as "points of interest" and "places to visit while in Marathon". But when you try to find them, there are no signs, no indicators, nothing. You have to hunt and hunt to find these places. And when you do, you usually look around and say, "OK, what was special about that? " I guess every town wants some claim to fame. Well, out of all the spots around Marathon, Pebble Beach was interesting. No beach, but instead, the entire shore was covered with polished round rocks. As you can see, they were not small rocks either. But just north of town, across from where we were parked, was Neys Provencial Park. We could bike 2 1/2 miles and reach the beach. This was only a few days after my disasterous 14 mile bike ride and those 2 1/2 miles back was all uphill. But I did it, with only a few spots where I had to walk the bike. Inukshuit. Our scavenger hunt had us making one of these. Well, we didn't even know what one was. Finally we found some info. It is an Indian word, and basically is a trail marker. But it is usually made to look like a man (or some semblance thereof). Now people make these and leave them along the highways as a way to say "I was here!". We made ours and left it on Trans Canada 17, north of Marathon. But by far, the best thing about Marathon was the visit to Pukaskwa National Park, Canada. 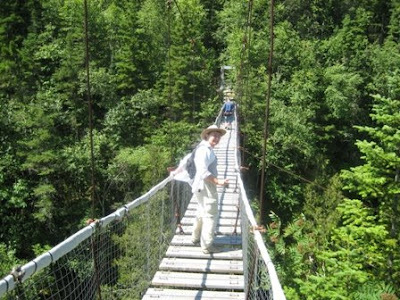 Here we hiked for 4 1/2 miles to reach this suspension bridge. It was 90 feet across and 69 feet high over a raging gorge. But it was the most spectacular sight in all of my travels across Canada. And what fun. We bounced and bounced on this bridge and no one told us to stop! We stayed in Wawa for 4 days, visiting the local area, kayaking a river, visiting a provencial park and doing some biking. But here is the view from our kayaks, back up to where we were parked (you can see a few of our RVs on the far, upper right). We were at Steephill Dam. The water running into the river on the left is from the overflow. This was about 8 miles north of town and some of our group saw bear and moose on their early morning walks. But on the visit to town we got to participate in a local recreation, 5 pin bowling. Now I have been bowing down yonder in the states for years, but this was a real challenge. All the balls are the same size and weight, no finger holes, you just hold them in your hand and roll them down the alley. And there are only 5 pins. Each pin has a different value assigned and you get 3 tries to get them all down. I won't even go into scoring. Needless to say, we all had a great time. And the winners of the 2 games got a prize of a harmonica from the proprietor. Our winners gave us a concert at our pot luck later in the week. We named them Willie and Willie, since they were supposed to be singing one of Willie Nelson's hits, The Train They Call New Orleans. Another day we went down to Lake Superior Provencial Park. It had a wonderful museum at the Visitor's Center. Here I am looking at some petroglyphs from hundreds of years ago. They are etched on the rocks above Lake Superior. In the same area there was this wonderful rock crevice which has had stairs carved for access. This is also from Lake Superior Provencial Park. Sand River was one of the rivers the fur traders traveled to make their living. When they encountered falls such as this one, they had to protage their 36 ft canoes and all their 90 lb bales of furs and trade goods sometimes several miles before finding calmer waters. I also found out I need another bike, one with more than 15 gears. We went on a 14 mile bike ride and I ended up walking the bike back uphill almost one mile on the return trip. My 15 speed bike just couldn't make it. Now I know this because I'm sure it could not have been me! I have done some checking with a local bike shop and they do assure me that a 21 speed bike has a much lower gear for going uphills. Luckily no one got a picture of me. The trip to Wawa was through some beautiful scenery along the Trans Canada Highway. Here is the view going downhill, overlooking Lake Superior. And yes, I took this picture while driving. Our first day at Wawa was visiting the local area and sights. There are many rivers running into Lake Superior and many of these rivers have falls. Although I saw many wonderful falls, I can't put all of them in this blog. Here I am in front of Scenic High Falls. This is supposed to be one of the highest falls in the east of Canada outside of Niagara. We actually kayaked this same river upstream. As you can see this is supposed to be a wonderful scenic lookout. But this is the view the morning we were there. Just a little fogged in. You can't even see Lake Superior, let along the lighthouse and all the other sights.